the nytpicker: Why The Weaknesses In The NYT's Coverage of the David Paterson Story Matter. Why The Weaknesses In The NYT's Coverage of the David Paterson Story Matter. It wasn't until May 19, 1973 -- nearly a year after the Watergate break-in, and well into the revelations that would eventually bring down a president -- that the NYT first referenced, in a meaningful way, the possible resignation of Richard Nixon. 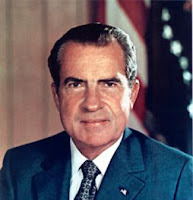 The White House said today that President Nixon had no intention of resigning. Ronald L. Ziegler, the White House press secretary, made the statement in response to a torrent of questions about resignation and impeachment at his regular morning briefing. The story ran just as nationally-televised hearings got underway before Sam Ervin's Senate Judiciary Committee. By then, Nixon aides John Ehrlichman and H.R. Haldeman had resigned, and the president had fired his White House counsel, John Dean. We went back to the Nixon coverage because we've been getting a lot of comments lately about the David Paterson story, and it made us wonder: Was the NYT, or anyone, this tough on Richard Nixon during Watergate? It wasn't until the so-called "smoking gun" was found in the summer of 1974 -- the transcript of Nixon's conversation with Dean on March 21, 1973, revealing the coverup plan -- that Nixon was forced to resign. The truth is that Paterson has probably done something terrible, and maybe even criminal; it sure looks that way. And we acknowledge the hard work and reporting the NYT's Paterson team -- Confessore, Kocieniewski, Hakim, Dwyer, Rashbaum, Kovalevski, Peters, and others -- has put in to shedding light on this sordid part of the Paterson record. We've been questioning the NYT's coverage of Paterson, and for one reason: we think the NYT has not demonstrated fairness in its stories about the governor. Its stories feel rushed. They're almost fully dependent on anonymous sources who surely have an interest in how this story plays out. They often change narratives without letting the reader know -- most especially in the depiction of Paterson's phone calls with Sherr-una Booker, the sequence of events at the heart of the matter. We've seen Sherr-una Booker's lawyer -- a slip-and-fall specialist named Lawrence B. Saftler -- completely change his account of those calls without the NYT once questioning his validity as a source. Remember, Saftler characterized the call as "about a minute," said there was nothing discussed about the impending court case, and said that Paterson told the woman, "I'm here for you." That scenario also disappeared on Friday, when the NYT offered an entirely new account of what took place -- a series of calls in which Booker and Paterson discussed the impending NYT's stories at length. So where does that leave Saftler? The NYT doesn't say. It's the tabloids pushing the resignation angle. We get it. The NYT is just following along. But the question has been asked and answered. It's time for the NYT to stop its incessant coverage of the effects of its stories, and to examine the record in a more definitive way. We'd welcome a big NYT story that laid out the new, most accurate version of the narrative, for readers just joining this saga in progress. It would give the NYT a chance to figure out what is true, what isn't, and what information we don't yet know. It's time for the NYT to remind its readers why it brought this all up to begin with. I am not sure it is the paper's job "to figure out what is true, what isn't." They have sourced what they can and reported what else they have. The conclusions to be reached are for each reader and, perhaps, others. They have done really great work on this. The Times was beat to hell on Watergate. I had little access to the Washington Post in those pre-internet (and, for me, college) days and really felt left out of a damned good story, while the Times just transcribed what others reported and said. I am not looking for a repeat of that performance.